Israeli PM Ehud Olmert has rejected calls by his defence minister to halt excavations at a contentious Jerusalem holy site, Israeli media has reported. Amir Peretz urged Mr Olmert to stop the digging near the al-Aqsa mosque for fear it will antagonise the Arab world. Mr Olmert declined, saying the works were causing no harm, the prime minister's office told the BBC. The excavation has provoked outrage among Muslims, who say it could damage the foundations of the mosque. There have been widespread protests among Palestinians and the wider Muslim world since the excavations began on Tuesday. The work is a prelude to the construction of a new walkway leading to the compound containing the mosque - Islam's third holiest site. The compound is also revered by Jews as the site of their biblical temples and therefore the holiest site in Judaism. 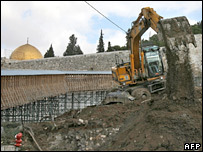 Mr Olmert rejected Mr Peretz's appeal to stop the excavations, about 60m (200ft) from the mosque. "A thorough examination of the matter would reveal that nothing about the work under way will harm anyone, and there is no truth in the contentions against the work," Mr Olmert's office said. The Israeli Antiquity Authority, which is conducting the excavations, says it is considering installing a 24-hour live video feed from the site to allay Muslim fears. The Islamic authorities in charge of the compound say two underground rooms lie under the mound which is being levelled. The work is intended to secure the area and protect archaeological artefacts that have not yet been uncovered, Israeli officials say. The compound area has been a flashpoint for violence since Israel captured it during the 1967 Middle East war. In 1996, Israel's opening of an exit to a tunnel near the site triggered riots in which 80 people died in clashes between Palestinian protesters and Israeli troops. And in 2000, the Palestinian uprising began at the mosque following a controversial tour of the site by Israel's then opposition leader, Ariel Sharon. Since 1967, the compound has remained under Muslim jurisdiction in conjunction with neighbouring Jordan.